The goal of Give Flight was to have five sets of aircraft wings built in less than one week then shipped out to five EAA Chapters across North America for incorporation into a completed aircraft. EAA wanted to demonstrate to Chapters and members that homebuilding is both affordable and fun, especially as a team. 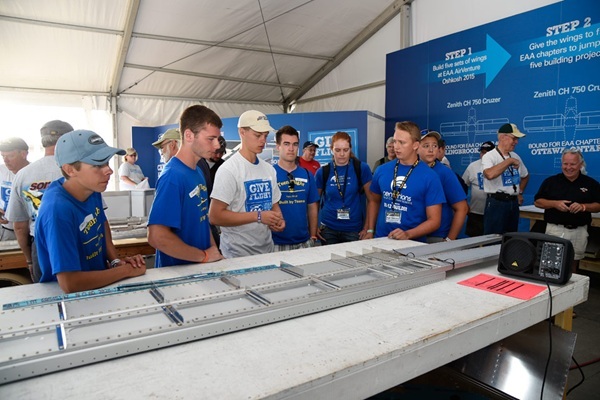 Five EAA Chapters were selected to receive the sets of project Give Flight wings built by volunteers and attendees at EAA AirVenture Oshkosh 2015. The wing sets will serve as the start of chapter building projects resulting in completed airplanes which will be flown to AirVenture in 2017 for their big debut. The Van's RV-12 wings went to Chapter 27 of Meriden, Connecticut; Chapter 555 of Las Cruces, New Mexico and got the Sonex Waiex wings. Three sets of wings were donated by Zenith, with 750 Cruzer wings destined for Ottowa, Ontario, Canada Chapter 245 and Bolingbrook, Illinois Chapter 461, while the CH650 wings were sent to Chapter 84 of Snohomish, Washington. Aircraft Spruce and Specialty donated each chapter a $500 gift and for their project and set up a discounted account for each Chapter to use for building components.